Robert Shepherd at Edmiston sends word of their appointment as central agent for the sale of SnowbirD, the 39m Hakvoort, launched just a year ago as Pretty Woman, and whose previous sale I reported in November 2010. Built to a design by Cor D Rover, the yacht’s striking contemporary interior was designed around a modern art collection by David Ostrander, the owner’s son, with Michaela Reverberi, and is featured in Best of the Best 2011. 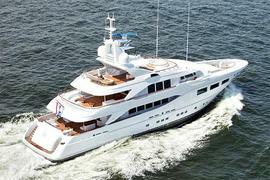 It accommodates 10 guests in a main deck full beam master suite, two doubles and two twins. Guest areas include an open-plan main saloon/dining area, a bridge deck saloon that opens to a sociable aft deck with seating and a teak table for alfresco dining, and a sundeck complete with spa pool, bar, barbecue, sofas and sunpads. Ideal for charter, the yacht is equipped with a range of watersports equipment and toys, including jet skis, Seabobs and assorted towable toys. Lloyds classed and MCA compliant, this superyacht has a range of 5,500 nautical miles at nine knots, and is powered by twin 600hp CAT diesels to a maximum speed of 13 knots. SnowbirD, which is currently lying in the South of France, is asking €22 million, and is also available for charter through Edmiston from €140,000 per week.